How are you, I hope you had a nice mother's day . How is the competition doing, any one sent you a link for a new recipe... I am reminding the people to participate. BTW, I am MIGHTY impressed you mnagaed to make your own... They are super-cute. 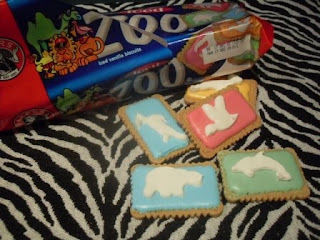 My kids love zoo biccies now - they even get some in their Christmas stocking. I prefer Romany creams myself - I could eat a packet all in one go quite easily. I miss the English biscuits - I never realised what a great range we grew up with there - chocolate digestives mmmmm - the ones we get in SA are nothing like the UK McVities ones. You are the best! I am so addicted to zoo cookies, whatever will happen to me now that I can whip them up myself? I remember Zoo Biscuits AND Romany Creams, but I was more of a Choc Kits girl myself ;-) I do rememebr eating them in exactly the meticulous way you describe at school though! Very impressed that you made your own! Very entertaining bokkie! 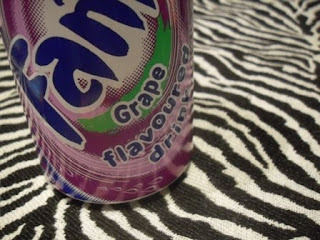 Ek het Liezel ook geroep om hierdie artikel te lees en ons het al2 so gelag vir die Fanta Grape. Ja presies, what's up with that? As a foreigner living abroad, I can appreciate finding those little items in you new country. I too have pushed my culinary boundaries to recreates things I couldn't find. Bravo. 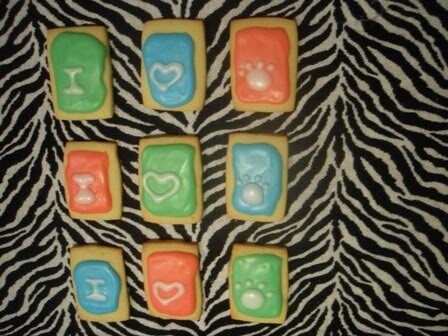 I am very eager to try Zoo cookies now. 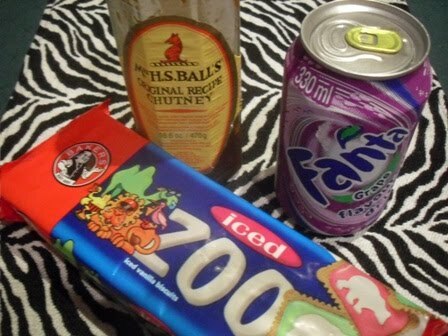 I nearly died reading your comments on zoo biscuits.My favourite when I was a kid in CapeTown.I remember putting the biscuit in my mouth and making it soft and then gobble it up before it broke in its sogginess!! Thank you for the memory! Dit is nou oulik! Wat 'n great idee, want ek VREK oor Iced Zoo en in Taiwan kan 'n mens dit natuurlik glad nie kry nie. I used to llive in Switzerland and every time someone from Sout Africa came to visit I too had this amazing list of weird little items that I craved .... Biltong, Crunchies, Peppermint Crisp, Chappies, Lion Matches, Zoo Biscuits, Tennis Biscuits, Marie Biscuits, Cola Tonic, Nik Naks, Simba salt & vinegar chips, Mr Balls Original Chutney, Nandos anything, Peanut brittle,.... the list went on and on. A friend once said to me she didn't know if she should bring a shoppng trolley to the airport or her passport to the supermarket.